Palliative Care is compassionate comfort care of the whole patient along with care of those who love and care for the patient. It emphasizes dignity and quality of life for those living with serious illness. Palliative Care is not the same as Hospice. Palliative Care addresses your physical, emotional and spiritual needs and those of your family. Palliative Care can be provided along with aggressive, curative medical care and offers the possibility of healing when cure may not be possible. We accept and support the choices you and your family make about your medical care and assist in communication of those choices to the medical team. Can I benefit from Palliative Care? If you’ve been diagnosed with a serious illness. If you have uncontrolled pain or other physical or emotional symptoms. You or your family needs help with decisions about medical care. You or your family needs support to cope with your illness. You are facing high-risk medical or surgical interventions. What does the Palliative Care Consult Service offer to me and my family? Expert management of pain and other physical and emotional symptoms. Emotional and spiritual support for you and your loved ones. Education for you about illnesses and treatment options. Help with clarifying goals of care and making choices about medical care. Communication of your needs to the medical team. We’ll follow you and your family through the course of the hospitalization and over multiple hospitalizations. We’ll refer you to community agencies to continue the plan of care after discharge. How does the Palliative Care Consult Service work with my physicians? The Palliative Care Consult Service communicates regularly with your primary physician and other members of the medical team so that everyone understands the plan of care. We provide the team with information about your needs and preferences. 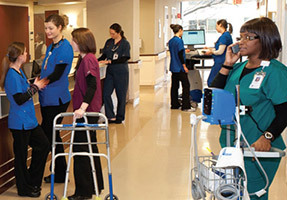 We will follow you throughout the hospital stay and will see you automatically if you are readmitted. Who pays for a Palliative Care consult? Most insurance plans will cover our services. The PMCS also relies on philanthropic support to cover those services that are not reimbursed by insurance. How do I get Palliative Care to see my loved one or me? All consults require an order from the attending physician. Ask your doctor to request a Palliative Care consult. Did you know our clinical staff wears color-coded uniforms depending on their role?